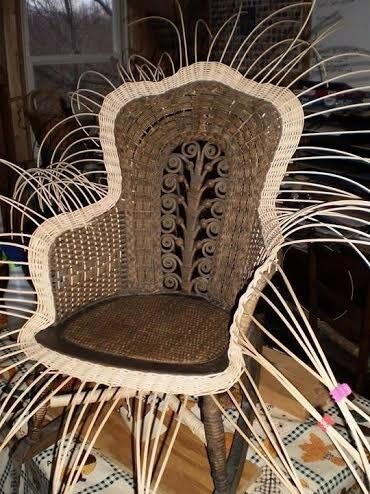 JWoods Enterprises–I have over 30 years experience in the wicker restoration business. My love of wicker furniture and respect for the art and history of wicker furniture is reflected in the enthusiasm with which I tackle even the most challenging jobs that I accept. Both antique furniture items and wicker baskets are well worth preserving for future generations. Modern wicker furniture is a continuation of the craft and ensures the need for wicker restoration experts well into our future. It is a confirmation of the comfort and appeal of artful woven furniture. I am dedicated to passing on the skills and knowledge needed to perpetuate the craft. For information on learning opportunities in wicker restoration visit my Facebook page or email me with your contact information. Follow the shop on Facebook to stay abreast of wicker for sale, and restoration examples. Thank you for your interest in restoring wicker furniture and baskets.